Sign up for the Chess list! Chess is one of the oldest games in the world. 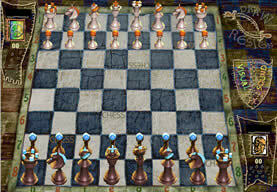 It is a game requiring great skill and intelligence - world champions have often pondered over moves for several days. Competition - One and a half hours for 30 moves, and an additional hour for twenty moves. Each player's screen has a clock indicating how much time and how many moves they have left. During their turns, each player moves one piece at a time. When castling a player moves two pieces. In order to move a piece on the board, the player must use the mouse. The piece will be highlighted when the mouse clicks on it. After the piece has been chosen, the player must then choose the destination square. If an illegal square is chosen, an 'error' sound effect will be triggered. The sound effect will be deactivated when the piece is chosen again. The cursor will change form when a legal destination square has been located. When a legal destination square has been chosen, the piece will be moved automatically, and it will be the other player's turn. When castling, a second piece is moved in addition to the first piece (the castling maneuver is executable by moving the King, or the Castle). When selecting a square holding one of the opponent's pieces, an animation will be shown of the piece being taken. Following the animation, the selected piece will move to the vacated square. When a player's pawn reaches the other side of the board, the player can replace the pawn with another piece (Queen, Bishop, Horse or Rook). New pieces are chosen using the 'pop-up' window. In games with time limits, there will be a clock displayed at all times in each player's screen. When it is the second player's turn, the clock will stop running for the first player and begin running for the second player. The declarations "Check" and "Mate" will appear automatically when a player takes his/her opponent's King, or when a player wins a game. The declaration of "Mate" will also trigger sound FX and visual animation. The declarations of one player will appear in the 'pop-up' window of the second player. The second player can either accept or reject declarations of "Surrender" or "Draw". When the game has concluded, the leader must choose "New Game" in order to begin another game. The leader also has the option of starting a new game at any stage after the declaration of "Surrender" or "Draw".